North Carolina education spending per-student ranks near the bottom of the nation, according to new U.S. Census figures released this week. The data, which do not factor in North Carolina’s growing spending on charters, placed the state at 45th in the nation, not counting Washington, D.C.
North Carolina charters are approved by the State Board of Education but run by private, non-profits. Of course, charter spending is of import in this discussion. Since North Carolina lawmakers lifted the 100-charter cap in 2011, the charter sector has risen to include 173 schools. A report this year from the National Education Association tallied up the state’s per-pupil spending, including charter funding, to $9,528 per student. According to the NEA, that ranks 39th in the nation, trailing the national average by more than $2,300. 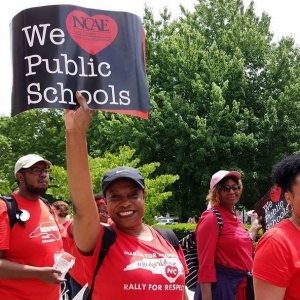 The new Census data arrive about a week after 20,000 to 30,000 teachers and education advocates swarmed Raleigh to rally before the N.C. General Assembly. Among their grievances, teachers complained of insufficient school spending, poor pay, cuts to their retirement benefits, over-testing, and hostility from state leaders.